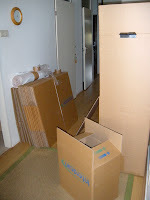 The mover has brought some boxes to the apartment so I can start packing my sewing and boxing stuff, clothes and books. What to bring to the other side of the world, what can I leave behind in Holland. For sure I do not need my winter clothes as summer starts in Sao Paulo, Brazil. Of course all my fabrics will come along, my new pincushion from the swap, and my shoes ;-D. My Bernina will be packed last! While packing and making other preparations, my thoughts are going into all directions. Before, when we arrived in a new place, the kids used to play in the empty boxes while I tried to get the house sorted out as quick as possible. This time around, they are not coming along as they are now living in London and New York. But hopefully with Christmas we can come together in our new place and hopefully, all boxes will be unpacked by that time..
Talking about cardboard: a few weeks ago I went to the Valkhof Museum and visited the exhibition 'O Fortuna'. One of the participating artist had made fishes out of cardboard, simple yet beautiful. I have no idea why I am attracted to this kind of art. 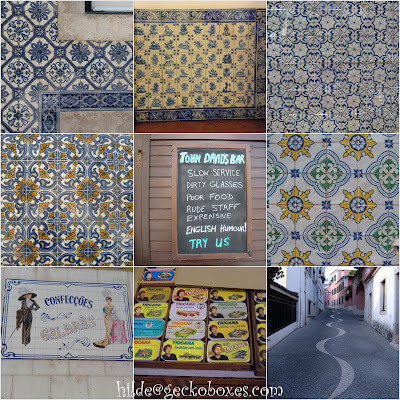 I love looking at these pictures taken in Lisbon in May this year. My DH and I went there for a short break in May and had a great time wondering around this beautiful old city and enjoying the Portuguese kitchen. While walking through the old neighborhoods we came upon many houses decorated with these tiles and along the beach we bumped into a funny sign. We had a wonderful time with lots of good food and wine and more inspiration for crafting! Here is my very special folded book with The Stitches from my Mom! 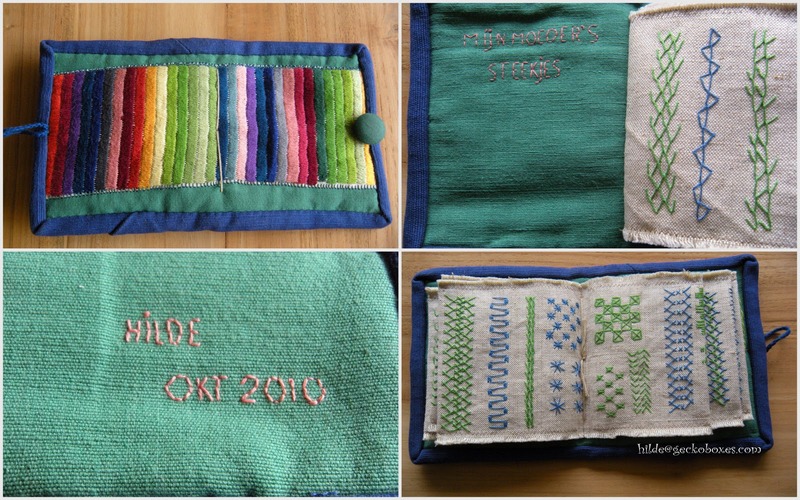 Yesterday I showed you the Stitch Sampler and I have folded the long sampler into 6 pages covered with a piece of left-over linen. 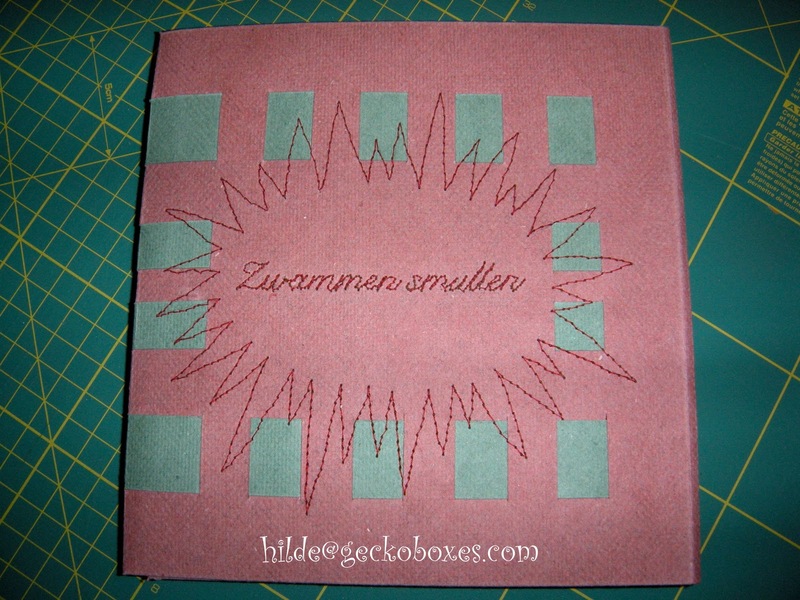 This linen is a bit stiff, so the binding became a bit bulky. Working with something made by my mom so many years ago, gives a very special feeling. Last week I stayed with my parents for a couple of days as my DH is back in Sao Paulo. While I was working on a quilt, my mom suddenly came to me with a small bag and inside were these beautiful colours. 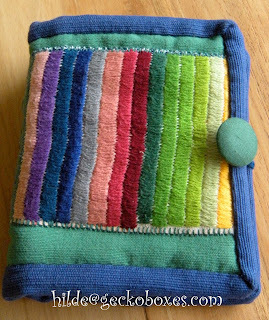 She used to make wall-hangings when I was a kid. One bedroom was converted into an art room where both my mom and dad used to have their own section, one side for the fabrics and one side for the wood crafts; I spend many hours there. This bag with these old DMC threads bring back good memories. Apparently I never finished this colourful sewing piece which was going to be part of a top. 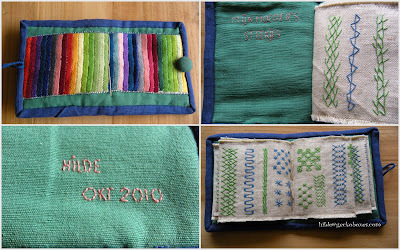 This stitch sampler was also inside and I simply love the idea my mom made all these stitches during her art lessons, just to see which of these stitches would work best on her art pieces. Some time ago I took lessons in bookbinding. The books we made were bound the traditional way with glue. 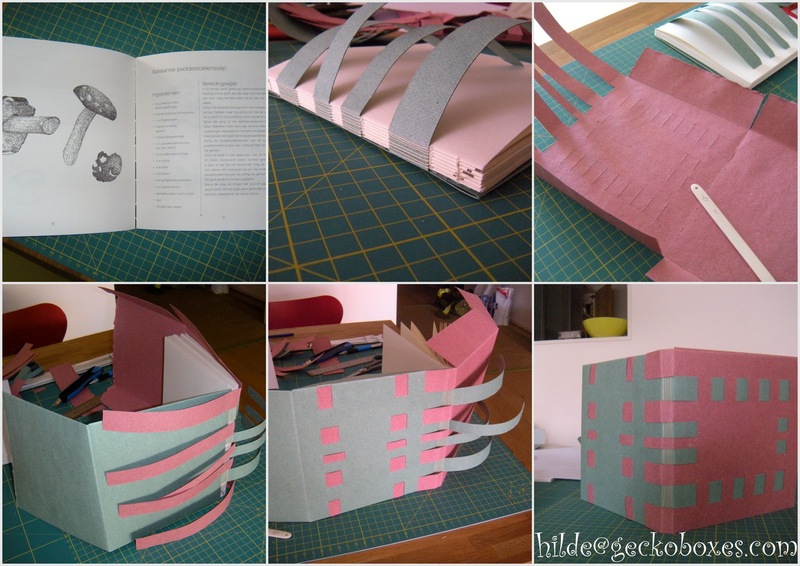 One day we did a workshop in bookbinding without adhesives and we had to weave the front and back of the book to make a strong cover. We used 'Zaans bord', a paper made in an antique windmill, the Zaansche molen. 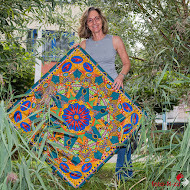 This windmill makes the paper out of textiles and the colors are a bit mat. I got hold of a plain copy of a cooking book with all kinds of recipes with mushrooms. This book has some lovely illustrations and I would like to give it to my mom. It is called 'Zwammen smullen' (Mushrooms feast). It is already some time ago I did this workshop and the instructions handed out are not very clear. I struggled a bit and made some mistakes but I know my mom will not mind. When I finished the cover, I thought it could use something extra. The sewing machine was still on the table, so I added some stitching to the front. This is not going to show on the inside as the cover is double folded. A dear friend of mine celebrated her birthday today and I made her a box. I got to know her in Saigon, Vietnam, where we shared a lot of our daily issues together with a group of other Dutch girls. We both moved back to Holland while the other girls moved on to different continents around the world. As she likes snake print and loves Italy after living there for a couple of years, I used papers with that particular design for the inside and outside and bookbinders linen in cherry pink. From a cardboard sheet I cut out all pieces, measured to the size of the biggest envelope that was going inside with a bit extra for easy handling. 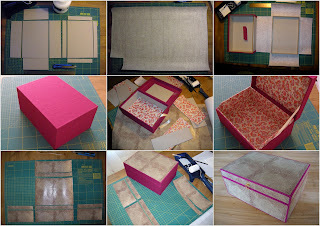 After gluing the parts together I put one whole piece of bookbinders linen around the top and bottom. Next step is adding in the 'inside box' and covering these parts with decorative paper. 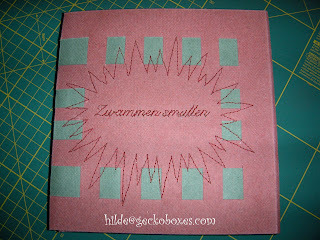 For the outside paper I tried the design to continue as much as possible from top to front, and from front to sides. Inside the box there were some surprises for her; personal wishes from all the Saigon girls and a special gift from all of us. When our DD was born, now almost 22 years ago, a lovely bunny came into our life to watch over her in her cot. The two of them became inseparable; wherever she went, he came along with her. 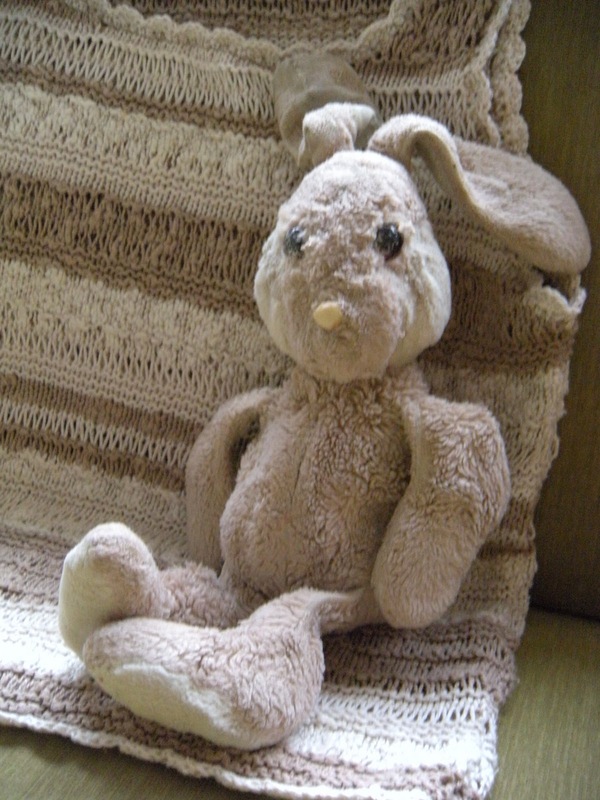 Despite always having the fear of losing "Knuffel" (Dutch for cuddle), this lovely bunny staid with her wherever she went and was always sharing her dreams at nighttime. Now my DD is living in London for a few months and Knuffel is here in our apartment in Holland, waiting patiently for her to join her when she moves on to her next stage in life. My DH was home for the past 2 weeks and I had time to work on small projects because he needed the table for his work. One day this week, when I came home , our ND (Naughty Dog) was enjoying himself with Knuffel! Eyes and nose ripped out of his old face, stuffing coming out of his neck... OMG, my first aid sewing kit suddenly came in handy! I was just working on an old top, which I made a long time ago. 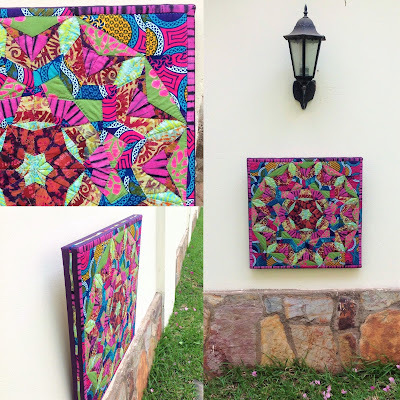 I did not like the style anymore, too wide everywhere, but I still liked the colours and the ajour pattern. With the sewing machine I made the body part tighter and instead of the sleeves, I added a crochet border. The same crochet I added around the neck and the waist. And now it looks nice again! While fixing Knuffel I felt like a puppet doctor, stitching back in the eyes and nose. My ND was very interested in the whole operation and looked very pleased at the final result... But of course I told him he'd better not even think about it!! !